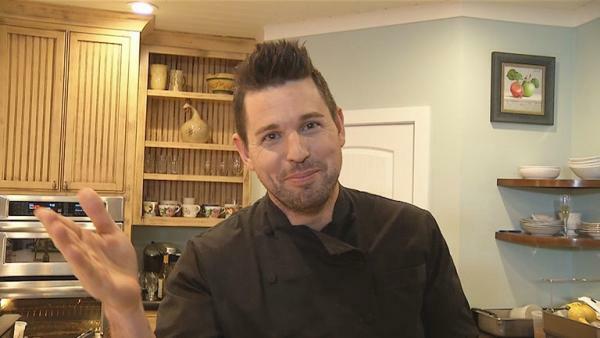 Chef Ryan Scott needs to cook a four-course gluten-free gourmet meal for a dinner party. The pressure is on because he has never made anything gluten-free before. Will his four-course menu be a hit? Ryan needs to help his friend, Elaine, put together a gluten-free dinner for big supporters of The Taylor Family Foundation, a Northern California nonprofit that runs summer camps for kids with life-altering health conditions. He heads to San Francisco's East Bay area to meet up with Elaine's daughter, Katie, who owns her own gluten-free bakery called Miglet's. Although going gluten-free is a popular diet fad, Elaine explains that some people are actually gluten intolerant and need to cut gluten out of their diets. If you're not gluten intolerant, Elaine says it's not worth going gluten-free because you will be missing out on the nutrition that comes from grains like wheat. There are many products on the market these days that are gluten-free, like pasta and baking mixes. Katie began cooking and baking gluten-free because of her mom, and her delicious cupcakes and pastries prove that eating gluten-free doesn't have to mean missing out. Ryan tastes some of Katie's cupcakes, that are made with substitute flours like rice flour, corn flour and little known grains like amaranth and teff. Ryan licks the remains of the salted caramel chocolate cupcake off his fingers. "That's gluten free? Who needs gluten when you've got that," he says. Ryan heads back to the kitchen with Katie and Elaine to learn how Katie makes her delicious gluten-free treats. She shows Ryan how to make chocolate chip cookies with a secret blend of rice flour, tapioca starch and potato starch, which mimics regular flour, plus xanthan gum, which is a binding agent. Ryan tastes the cookies and loves them, so now he just has to figure out Katie's secret ratio. Ryan gets to work on some gluten-free recipes for Elaine's dinner. He starts with a baked pasta dish, using corn pasta as a substitute. He also makes his own sausage with ground pork and spices to flavor the dish. Ryan shares a few of his favorite cooking tips when making pasta. First, always salt the water, as it flavors the pasta. Second, when you put the pasta in the water, face the bowl away from you, so you don't get splashed and burned by the hot water. Third, Ryan likes to put a ladle of salted pasta water into his sauce for flavor. Ryan's learned a lot about gluten-free cooking, and now it's time to put it to the test. Ryan arrives at Elaine's house, where here dinner guests will soon be, ready for a gluten-free gourmet meal. Making a gluten-free dinner was challening, so he based it around protein and vegetables. He tells Elaine about two appetizers he has planned - a cauliflower salad and some seared scallops. The main course features two pieces of meat - a tenderloin and a short rib. Ryan and his sous chef, Sophia, are busily prepping the meal in Elaine's kitchen. When Elaine sees the results, she's impressed and can't wait to serve it all to her guests, who are arriving in a limo. Once they arrive, Elaine introduces Ryan, who tells them about the food. "We're going to have a lot of fun and it's completely, 100 percent gluten-free," says Ryan. The guest love each course and are very impressed by what Ryan put together. "I think what he showed is that you don't just have to substitute out gluten to make it better," said one guest. For dessert, Katie made a marzipan angel food cake covered in fresh berries and whipped cream. Overall, Ryan learned a ton about gluten-free cooking and is glad to have served these wonderful guests a gluten-free gourmet meal! You'd never guess these delicious, slightly salty, soft and chewy cookies were gluten free! A hearty baked pasta dish that can be made in one pot and no one will know it's gluten-free. A "meaty" vegetarian salad that will please carnivores and herbivores alike. Seared scallops taken up a notch with a mushroom dust crust and beurre blanc sauce. Two different ways of cooking meat into tender, succulent bites. Go behind the scenes as Chef Ryan Scott cooks a four-course gluten-free meal for the first time!